Beamz Interactive, Inc. (OTCQB: BZIC), an interactive music product and technology company, today announced the winners for its Beamz Player Video Performance Contest. Beamz artist judges David Ellefson, Euge Groove, Craig Chaquico and Jerry Riopelle reviewed the video performance entries and selected the top 10 finalists. Thereafter the finalist videos were published to the Beamz web site for online voting to determine the winners. 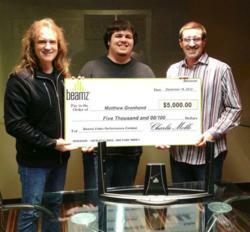 The grand prize winner, Matthew Gronhovd from Phoenix, Arizona used the Limited Edition David Ellefson Beamz Player performing the Beamz original song Classique. David Ellefson presented the $5,000 cash prize to the grand prize winner this week at the Beamz office in Scottsdale, Arizona. The video performance of the second place winner Matthew Ballard featured the interactive version of the Euge Groove chart-topping song Chillaxin combined with playing a guitar with the Beamz Player, showcasing how traditional instruments may be used with Beamz to create unique performances. The third place winner, DJ Johnny Blue featured a performance setup with three Beamz Player laser controllers connected to a tablet computer interacting with the Beamz original song Club Techno. The winning videos from the contest may be viewed on the Beamz web site at http://www.thebeamz.com/contest-winners.